Last week the friends and family of Dynasty Brush got together with our friends at Splashes of Hope to take things from clinical to colorful at hospitals and medical clinics. You may remember from a previous post on the blog, that Splashes of Hope and Dynasty Brush have a very special relationship forged through the hearts of both Splashes of Hope founder Heather Buggee and FM Brush's late CEO Frederick V. Mink. 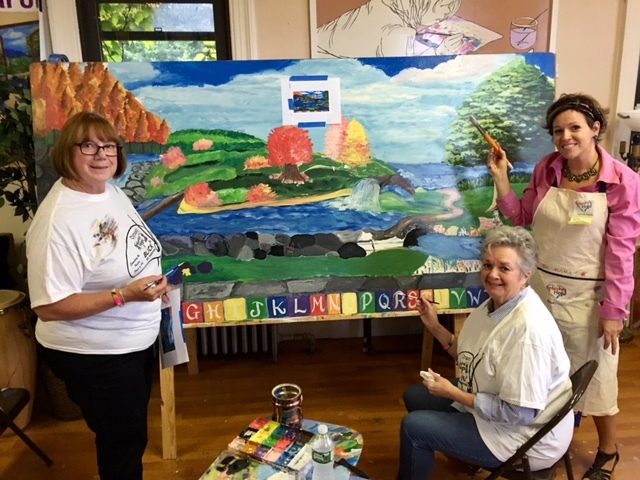 We got together at the Splashes of Hope studio at the Suffolk County Park's historic Coindre Hall, on the grounds of West Neck Farm in Huntington, New York. Coindre Hall is a beautiful medieval French chateau-style mansion designed by architect Clarence Luce that overlooks Long Island Sound. It made for a lovely location for us to paint and create! 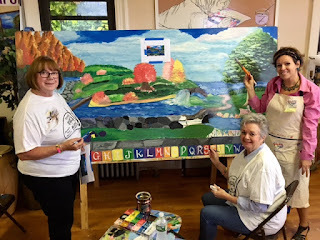 With the help of Dynasty Artists, FM Brush family and friends, Splashes of Hope painters, and members of the Decorative Artists of Western Nassau, we soon got to work painting all sorts of ceiling tiles and murals to be installed at the Northport VA Medical Center. 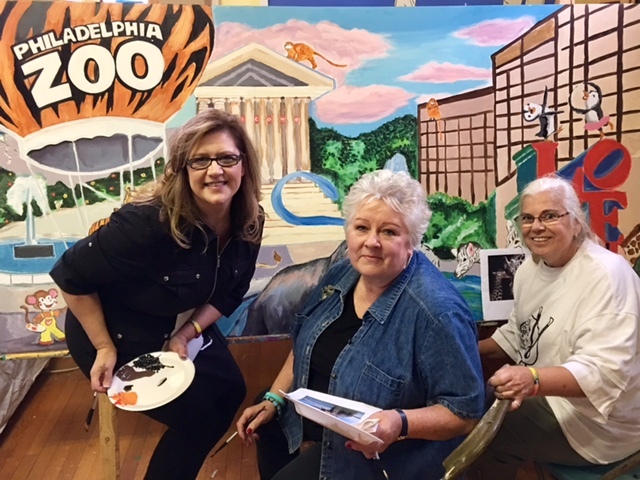 Dynasty Artist-In-Residence Shar Sosh and Splashes of Hope Senior Mural Artist and Project Manager Sarah Baecher chat with Splashes Star Ethan Chang and his mom. Dynasty Artist Sandy McTier "monkeys around" at the event! One of the hightlights of the evening was Dynasty Brush and FM Brush giving a special gift to Heather from Splashes of Hope to thank her for all of her hard work. Dynasty Brush's Director of Marketing Veronica Towey presented Heather with a Dynasty Brush "bouquet" made up of Heather's favorite brushes: Blue Ice and Orange Ice! Would you like to see more photos of the event? Check out the album on our Facebook page! Would you like to help Splashes of Hope #splashitforward? Go here to donate and go here to volunteer! Our next blog post will feature Dynasty Artist Sandy McTier--stay tuned! As always, if you want to learn more about Dynasty Brush please visit our website. Photos in this post appear courtesy of Veronica Towey. Our Social Media Coordinator and Dynasty Blogger Lori would like to give a special thanks to Veronica and Sandy for all their info and photos.